Rabies is caused by rabies virus (RV), belonging to the virus family Rhabdoviridae. Rabies is a zoonotic disease that is transmitted from animals (particularly dogs, foxes, wolves, jackals, monkeys and bats) to man. Infection can be transmitted from a bite or scratch via a puncture wound through the skin, or through a lick on an open wound or sore. Rabies occurs in every region of the world, but there are some countries, such as the UK, Hawaii, Panama and Australia, that have eradicated the infection. Rabies is common in India, Russia, Africa, the Phillipines, Central Europe, China and Japan.n Rabies can be reintroduced into countries that have eradicated it, so it is always wise to check if it is present in countries you are visiting (so you can be aware of the risk and the need for prophylactic rabies vaccine). The incubation period in man is usually 1–3 months, but it can be as short as 10 days and as long as 2 years, following exposure. The incubation period in the dog is usually from 14 to 60 days, but it may be much longer. 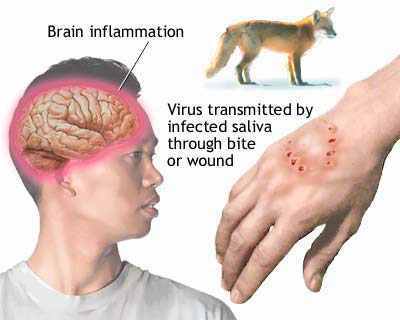 Once infected, animals remain infectious via infected saliva. Rabies is usually a fatal infection in animals but asymptomatic infection, especially in bats, is recognized. The bats may provide a long-term reservoir of infection. People are at risk when they have not received prophylactic vaccine and they are bitten or scratched by an infected animal, or licked on an open wound, in a country where rabies is prevalent. For the first 2–4 days, patients usually develop malaise, fever, headache, sore throat and lack of appetite. The virus first multiplies in the tissue around the site of inoculation. It then moves into local nerves. Pain and tingling around the site of inoculation in the infected limb is usually the first indication that the virus has entered the nervous system. These symptoms usually travel up the limb or spread around the face or neck, depending on the site of infection. Jerky movements and increased muscle tone may well follow. Dilation of the eye pupils and excessive secretion of tears and saliva often occur next. The patient may next become anxious and frightened when examined or disturbed, and the patient’s temperature rises to 38–400C. Localized paralysis may follow, resulting in difficulty in swallowing and in the patient being terrified of drinking. The fear of drinking water (hydrophobia) is very suggestive of rabies. Patients may be very excited or apathetic. With very few exceptions, patients die within a week of the onset of symptoms. Tetanus can cause similar convulsions. Once symptoms have become established, there is no effective treatment other than supportive care. Pre-exposure prophylaxis is with 3 doses of rabies vaccine. Post-exposure prophylaxis is either by 5 doses of rabies vaccine, over a period of a month, or, if the risk of rabies exposure is likely, by means of vaccine and human anti-rabies immunoglobulin (half injected around the site of inoculation and half given intramuscularly). It is very important to seek urgent medical advice in the case of a bite or a lick or scratch from a suspect animal abroad, especially if it was behaving aggressively. Even in the case of previous rabies vaccine, it is strongly advised to have post-exposure vaccine where a significant risk of exposure has occurred. Rabies does not spread from human to human, but gloves and an apron should be worn when treating patients with suspected rabies. Healthcare workers caring for an infected patient should be offered rabies vaccination.